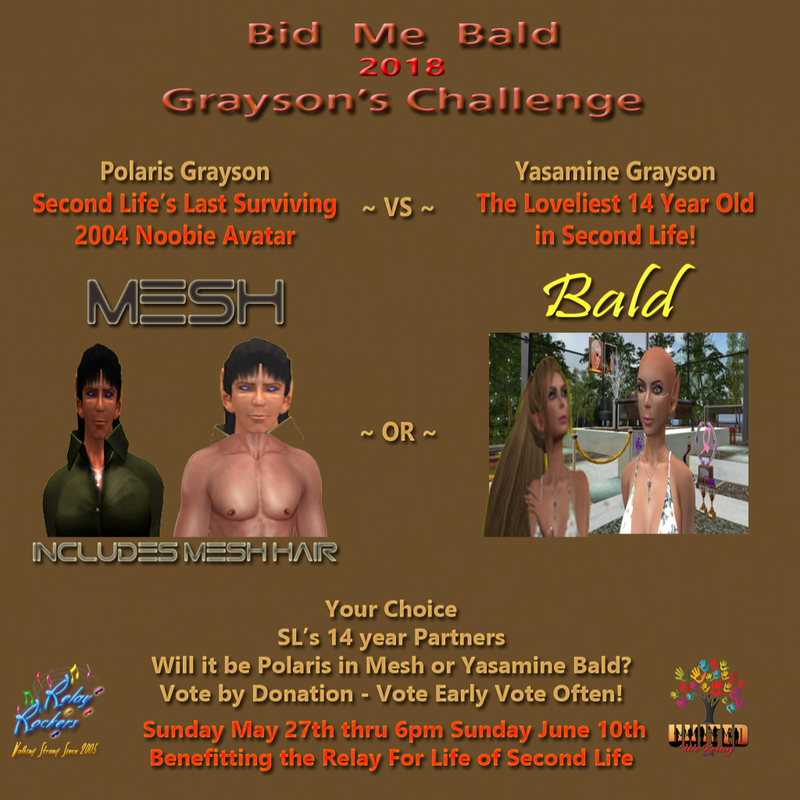 Second Life Newser: Press Release: "Bid Me Bald" vs "Grayson's Challenge"
Press Release: "Bid Me Bald" vs "Grayson's Challenge"
Its the Bid Me Bald 2018 Grayson Challenge.. with a twist! Each Year Yasmine and Polaris Grayson, compete to shave the other bald, This year's gonna be its different! After 14 years on the grid, Polaris is the Last Surviving 2004 Noobie System Avatar on The Grid! He has agreed change to a MESH Body and Hair versus the hair of Yasamine Grayson, the loveliest 14yr old in Second Life. The Graysons came to Second Life together, from There, on May 24, 2004. Since that time Polaris has worn only system clothes and hair. Yasamine thinks its time for him to adapt to a more contemporary avatar and is willing to put her long blonde locks on the line against him. Here is your chance to take part in history in the making! Beginning May 27th there will be 2 Relay For Life kiosks, one labeled MESH the other BALD, placed at the pier in Arinultra Cay. Vote for your choice and on June 10th @ 530pm we will total the Kiosks to see if we Bid Polaris MESH or Yasamine BALD. "Its about time," Yasamine stated. "I do look good bald, but Polaris really needs an update!" Polaris replied, "What about historic preservation? How else can we measure progress if we don't preserve our relics?" The choice is yours, its up to YOU! Bid Polaris Mesh or Bid Yasamine Bald! 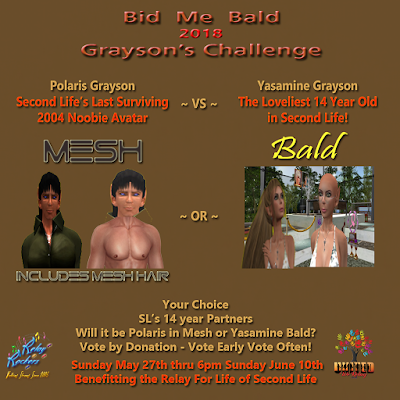 The Original Bid Me Bald and the Grayson Challenge are held by the Relay Rockers in support of the American Cancer Society and the Relay For Life of Second Life. All proceeds support the Society's mission to Save Lives, Celebrate Lives and Lead the Fight for A World Without Cancer! It's an event that Trader Whiplash called "Second Life history in the making."